The term "Fiero" is a word which describes the unique emotion which is felt after a significant problem is solved or a great accomplishment is achieved. And while it can occur in any field of human endeavor and is certainly not limited to sporting events - it's on the field of athletic competition that its body language is most commonly captured on camera. The termed fiero was coined by Italian Psychologist Isabella Poggi, and does not have an English equivalent. Interestingly and unfortunately, although English does have more words than any other language - it suffers from a significant relative deficit of words which describe the many nuances of emotion, particularly positive emotional experiences when compared with many other languages. In the image above, one of Germany's midfielders Mario Götze (No. 19) has just scored what turned out to be the winning and only goal in the 113th minute of the 2014 World Cup Championship final vs. Argentina. Götze is in the midst of emotionally processing the event along with his teammates Thomas Müller (No. 13), André Schürrle (back, left), and Benedikt Höwedes (No. 4). 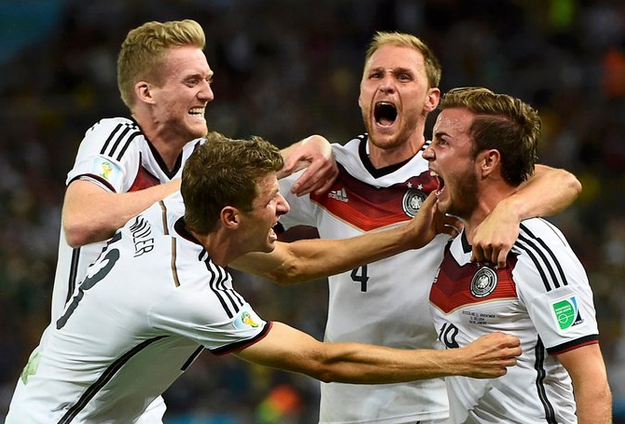 Note the prevalence of their wide open mouths and Schürrle's baring of his bottom teeth. Additionally, flared nostrils with extreme mid-face tension as well as eyebrows contracted together and centrally drawn downwards would, in other contexts, cause many to find these facial expressions as those of extreme pain, fear, and/or anger. And although in the first few moments there can be some fluctuation in what is displayed - very shortly these nonverbals will be replaced by expressions much more recognizable of extreme and pure joy.